Your accounts need to have the same email address on here and the account you wish to link to. After you've linked accounts, any credit you generate for DNA@Home or SubsetSum@Home work units will be added to the project on those accounts. If you don't have an account there, your account here will be used to generate credit there. Message 2995 - Posted: 10 Aug 2014, 12:07:46 UTC - in response to Message 2993. I'm not sure whether I understood it the right way: I have to delete Wildlife@home form my BM and put in CSG instead? How long after linking accounts does it take for things to combine in my Citizen Science Grid account? As Defender has asked do I now detach from WildLife, DNA and SubSetSum then re-attach to Citizen Science Grid only? Message 2997 - Posted: 10 Aug 2014, 20:26:07 UTC - in response to Message 2995. Message 2998 - Posted: 10 Aug 2014, 20:27:26 UTC - in response to Message 2996. Hmm could you email me a screen shot? I've been tweaking the webpages so I might have broken something if this is still happening. CSG is currently using the Wildlife@Home database, but I've added things for tracking SubsetSum and DNA@home work units to it. OK Travis I am not sure the e-mail I sent to you actually had anything in it. So I sent you a PM as well. I have now detached from all 3 projects on all 4 of my computers and then re-attached them to Citizen Science Grid. BOINC Manager says all is hunky dory but message log says Project Down for Maintenance so my projects are not linked to CSG and my computers do not show up as connecting as of today. All information is from Wildlife, score totals computer connections (mid July last Wildlife connection, so that is how I know they haven't talked to CSG yet) and nothing in preferences yet as well. That Database error message is still appearing at the top right of the account page on CSG. Message 3001 - Posted: 11 Aug 2014, 0:56:30 UTC - in response to Message 3000. The database error message should be fixed now. I'll be adding the DNA@Home applications soon and sending out some work units, so that might be why you're getting a project down for maintenance message. My rigs are not showing up on C.S.G. 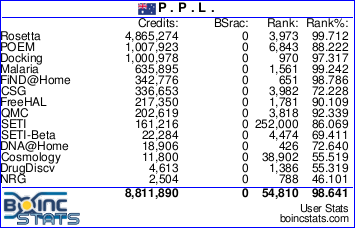 even thought they are attached & it is shown in the Boinc manager but not on my account page here? And my credits from DNA are not showing either. Message 3005 - Posted: 11 Aug 2014, 9:28:38 UTC - in response to Message 3004. 1103	http://volunteer.cs.und.edu/csg/	11 Aug 10:39:15	Sending scheduler request: Project initialization. Message 3006 - Posted: 11 Aug 2014, 13:03:00 UTC - in response to Message 3005. Message 3007 - Posted: 11 Aug 2014, 14:10:36 UTC - in response to Message 3006. I have gone ahead and connected my computer to the Citizen Science Grid successfully. However I have about 12 or so DNA@home tasks on my computer in the process of being run so I am reluctant to detach from the project at this point unless you want us to go ahead and abort these tasks to complete the process of moving over to the new grid. Please advise what you want me to do. Otherwise I will wait to detach until these jobs have finished running. Message 3008 - Posted: 11 Aug 2014, 15:19:29 UTC - in response to Message 3007. I'm going to keep the DNA@Home daemons running until all the work units that are out have come back, so please keep crunching them -- that way everyone will get credit for them. Message 3114 - Posted: 15 Aug 2014, 14:41:03 UTC - in response to Message 3008. Ok, Travis, its past the deadline on all these jobs now but none of them seem to be able to communicate to report. HELP!!! Message 3120 - Posted: 15 Aug 2014, 17:55:46 UTC - in response to Message 3114. Just to get things moving so I could actually start testing the assimilator and validator (I made a few posts to the old dna@home forums as well as here) I shut down the DNA@Home daemons -- all the comments seemed for it! You can just disconnect and discard those WUs. I hope it wasn't too much lost credit -- if so I could bring back up the daemons over there and try and figure out the difference in credit, but that might take a little while. Message 3121 - Posted: 15 Aug 2014, 22:24:40 UTC - in response to Message 3120. I guess I will forever be at 0 credit on the old project. lol, these were going to be my first tasks on it. Oh well. Credit isn't really important to me anyway. I would rather see you get the work accomplished than get credit in the long run and I only held the jobs on my system because you told me to. OK, Not sure how to cancel them out at this point as some how they have to be reported but maybe deleting the project will do that. I'll give it a try and see if that does it. Message 3122 - Posted: 15 Aug 2014, 22:28:27 UTC - in response to Message 3121. That did work = Deleting my project removed existing tasks so now I only have Citizen Science Grid showing on my system for your combined projects. Message 3125 - Posted: 16 Aug 2014, 13:46:54 UTC - in response to Message 3122.